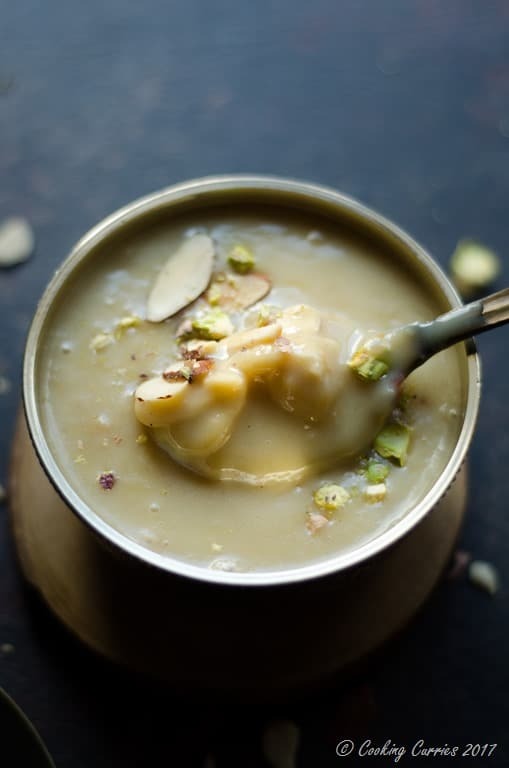 Creamy milk reduced to a thick pudding of sorts that is sweetened with sugar and made fragrant with saffron and cardamom, one spoon of this rabri is enough to make you forget about all the woes in this world! You stand by the stove top, watching the milk boil, separating the cream to the side, stirring it, watching more. And you wonder, is it all worth this? And then you see it thicken up and reduce down and you can smell that thick sweet scent coming out of the pan. 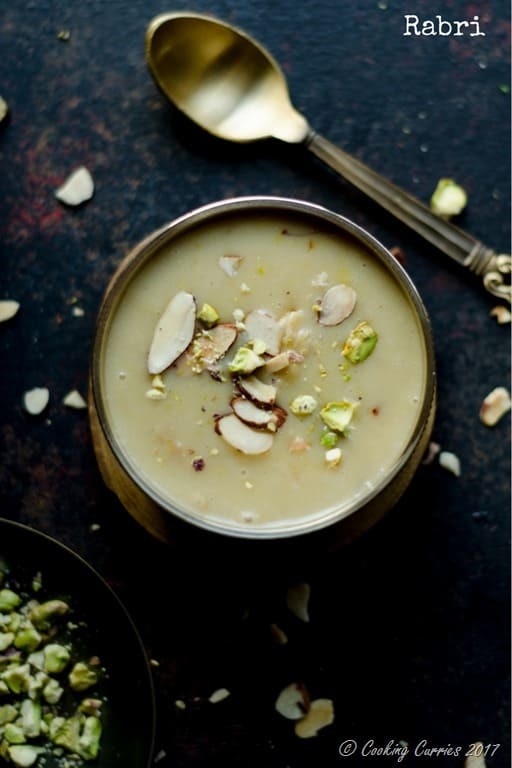 You add some cardamom and saffron to it and boom, the fragrance in the kitchen explodes to a whole new level, that you think, maybe they should make candles with this scent. And then you know it is done and wait for it to cool down. You would ideally want to chill it in the refrigerator before devouring it. But who can wait? You tell yourself, you deserve it! After all, you are the one who spent all that time making it, it did not get made on its own, right? Of course! And then you grab a spoon, dip it into that thick creamy concoction. You almost put the spoon into your mouth immediately, but it burns you as it touches your lips. You cant wait. You blow on it furiously, almost willing it to cool down. And then you taste it. Ah!! The heavenly sweet, smooth, creamy and milky spoonful was definitely worth it! Ladies and gentlemen, I present to you – Rabri! If this is not the nectar of Gods, then I don’t know what is! 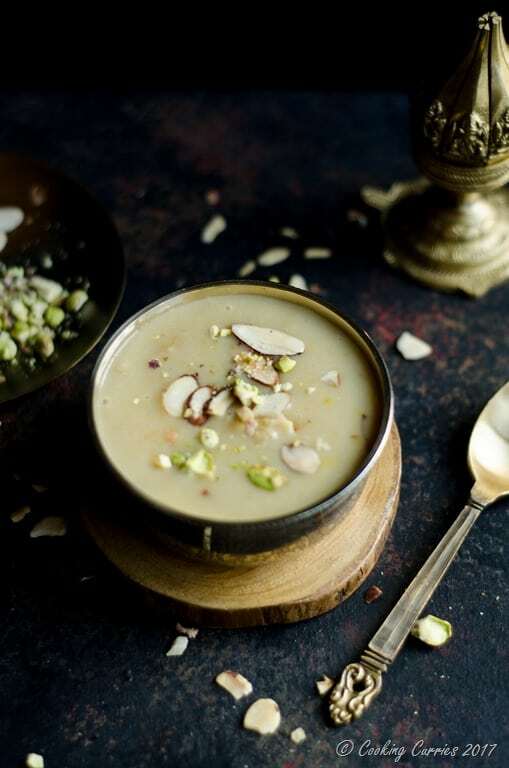 This Northern Indian dessert preparation can be had as it is, topped with some toasted and crushed nuts or used as a topping on a sweet pancake called Malpua or a Fried Bread delicacy called Shahi Tukda or sometimes even Gajar ka Halwa – a sweet carrot pudding. 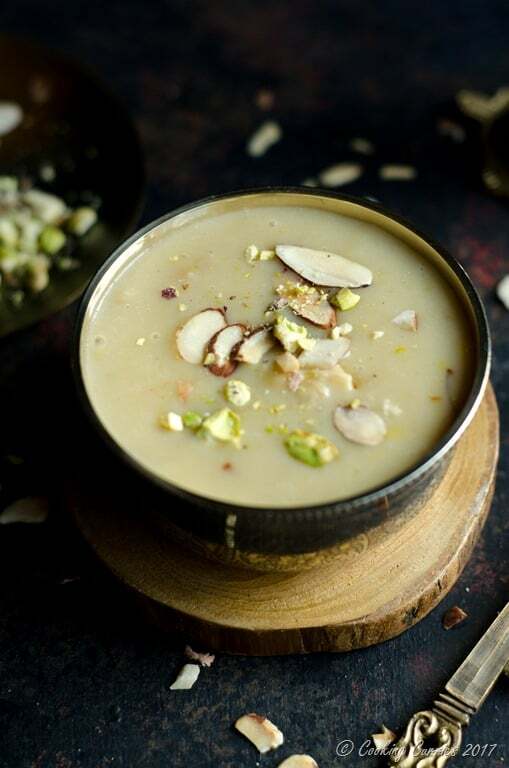 Rabri has a close cousin in the Southern parts of India called Basundi, though the latter is not as thick as a rabri. Some use condensed milk to make the rabri to make a quicker version and some use corn starch to thicken the milk to get it done quicker. Neither, especially the latter, gives the milk all that time to naturally thicken down and give out all that concentrated yet muted milky sweetness. This method takes a little bit more time and I strongly suggest you make it this way, at least once, to see what the fuss that I am making is all about. If you follow me on Instagram, you would have seen this on Insta Stories, about me making the rabri. I made it one night and let it cool down to room temperature over night. That way I resisted the temptation to spoon some into my mouth every time I walked into the kitchen. The next morning, I put the rabri in the refrigerator to chill and made some hot crispy malpuas and then topped them with this rabri. I saw heaven and came back, that day. The malpua recipe will be coming soon in a couple of days. Meanwhile, enjoy the rabri. In a heavy bottomed pan, preferably non-stick, heat the milk and sugar and bring to a boil. Move aside, the cream that floats on top, and stick it to the sides of the pan. Reduce heat to medium and add the heavy cream. Keep moving the frothy cream layers that come on top, towards the side of the pan and keep stirring every few minutes or so. Watch it closely so as to not burn the milk. If you want to see how much the milk has reduced in quantity, bring the heat to the lowest and the milk will settle down and you will be able to see. Ideally, you want the milk to reduce to at least half its original quantity. 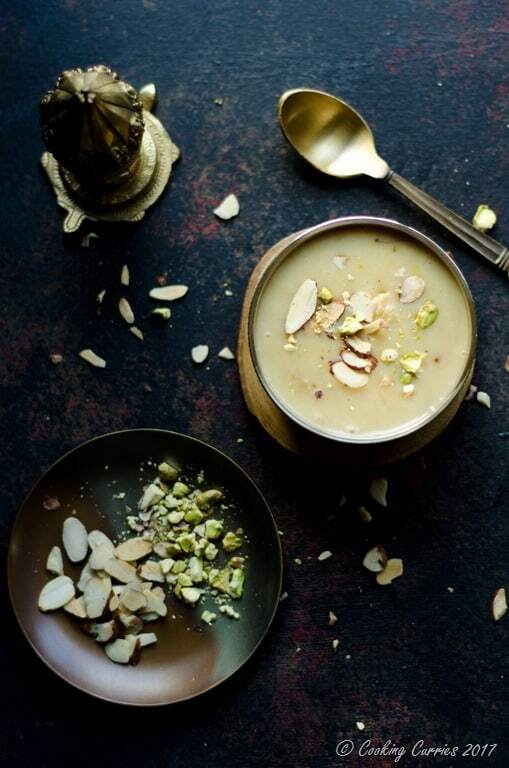 Add the ground cardamom and saffron strands and cook till the milk has reduced to half its original quantity. Let it cool in the pan. Once cool, pour it into a bowl and scrape off all the cream that you moved to the side and stuck to the pan. Add this to the rabri. Refrigerate for at least 30 mins to chill. When serving, top with almond slices (I like to toast the almond slices a little) and crushed pistachios.